This music video by Jimmy Wayne captures much of what we’ve been talking about in regards to Sonship. The little boy keeps reaching his arms out asking for love from his dad. Even though he is rejected, he pursues. He never gives up hope. And as you see rather emotionally, he comes to the realization that the very things he wanted from his Dad, God was always offering him. With arms stretched wide, God never gave up, never quit pursuing us even to the Cross. As Morgan said this morning, “God is bigger than the loss of a father”. You see that in this music video. In Braveheart’s opening scene we see young William with his father, enjoying him, knowing he is loved. Then innocence is lost. The assault comes. He loses his father. At the funeral, the girl comes and gives him a flower. The flower is God saying to him, “Don’t shut your heart down.” The uncle comes and takes him in. He teaches him manhood and the things of a warrior. Teaches him Latin. Wallace goes on pilgrimage and in so doing, releases control. He goes away from home to be fathered. Leaving the old life and going on pilgrimage is the greatest risk you will ever take as a man but you must go. The only way to receive God as father is to relinquish control of the world you have, the safety, the demanding of your father to come through for you dead or alive – you have to leave that and receive God’s invitation to take a pilgrimage away from home and to be fathered by Him. In Morgan’s life, he had father wounds via a dad who worked 7 days a week. But it has come full circle. He now sees his Dad as a father but there is no pressure on the man to come through. Morgan no longer demands that his father come through to meet his needs. Morgan is a validated, confidant man. He knows his True Father and he knows what God says about him. So he can release his dad, enjoy him and even offer a strength to him. Morgan serves under really good kings. Godly men – John, Bart and Craig. Each is a part of Morgan’s father image. Each brings him something he needs to soak in – things his earthly father can’t provide for him. But no single man can fill that need for “father”. It is too much to put on a man. He even had an 83-year old woman teach him how to shoot a bow! Morgan needed someone to teach him, prayed the Father to come and father him through this and at the bow store, he gets an 83-year old woman. So Morgan goes with it and as it turns out she was an Olympic archer who has taught youth for 43 years. Morgan questions, “How do you give him what you don’t have?” That’s a real question for all of us as men in regards to our sons. If you didn’t “get it” from your Dad, what do you bring your son? Morgan is now very, very intentional about what he is bringing to his own 10-year old son – from teaching him about bow hunting, knives, camping, processing a deer, reading books, riding bikes, campfires and stories, Saturdays at Dunkin Donuts … Morgan is present in Joshua’s life and intentional about schooling him in the art of being a man … fathering him. A little humility and a lot of questions and God will father you through it. And as each sage comes along and teaches you and shows you how … a little substance is transferred to you as a man. Find men and ask them to father you. When the student is ready, the teacher will appear. When the son is ready, the father will appear. He will discover that the father needs him as much as the son needs the father. The sage gets much from showing you the way. God will father you. He will show you the ancient paths. If you invite Him in and let Him do it. It is available. More. We need to first ask Him to heal our unbelief that He can or will. It all starts with releasing our earthly fathers – letting them go, taking the demand off of them (whether dead or alive) that they must come through for you. Once you release them, you see them as a son just like you are – it radically shifts the relationship. No longer insisting that they come through, you will find you can come alongside them and that you have much to bring to them. It starts here and then it goes to asking other men (or 83 year old women!) to father you in many things from bow hunting, to finances, to marriage, to fixing things around your house or many of the “I have no clue … will you show me’s” in this life. And most importantly, it is ALL about asking The Father to father you. Bring God in and let the Father speak into your heart. “I’ve come to this place in my life I’m full but I’ve not satisfied this longing to have more of You. And I can feel it my heart is convinced. I’m thirsty my soul can’t be quenched. You already know this but still come and do whatever You want to. I’m standing knee deep but I’m out where I’ve never been and I feel You coming and I hear Your voice in the wind. Would you come and tear down the boxes that I have tried to put You in. Let love come teach me who You are again. Would you take me back to the place where my heart was only about You and all I wanted was just to be with You? Then you crash over me, and that’s where You want me to be. Tomorrow morning at 6am on being “fathered by God”. What kind of man … ? Here is the question for you today… “How big are you willing to dream? How big a life will you live?” If you have not read last week’s blog post (Wild at Heart – Adventure 2), please do so. Last week, we discussed the Holy Spirit as the “Wild Goose”. He cannot be tamed and we never know where He is going. Is He safe? No, but He is good. We said that life without the Spirit is boring and domesticated. Jesus didn’t die to make us safe and comfortable – He died to make us dangerous to our enemy in the battle for a lost world. And yet, too many of us are living lives of mediocrity buried by all the responsibilities we have. Where is your passion? Where is that excitement you once had when you were an emboldened new believer unafraid to share your faith? It’s a choice. What path are you going to take? Clearly, it’s easier to sleep in. No question. It doesn’t risk much to stay at home. Manschool is risky. It is an investment of your time, energy and faith. We’re going to push you. Men will challenge you. We go deep and go into areas you typically don’t hear discussed in church – frank, honest, candid discussions among our Tribe as we seek to grow closer to God. The question we discussed this morning revolved around just how big our lives were going to be. 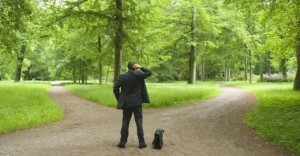 All men stand at a fork in the road and Yogi Berra once said, “When you come to a fork in the road, take it”. One path is an intimate walk with God. It is Sonship. It is accepting that God is my Father and that He chose me before creation and that He delights in me. It is a radical choice, a radical walk. It is the Wild Goose and it cannot be managed. You certainly will not be able to control it. If the Wild Goose leads you to give up your career and your home and enter the mission field or the ministry … is any part of that “safe”? This path requires huge faith. It is a life where we cannot control the outcome. It is a life where your vision and your dreams are so big that God has to show up in order for it to work. It is giving up caring what others think and embracing a radical walk with God. All of us were created for “more”. Way more. But our wounds, our fear, our shame, our self-doubt they hold us back and they cause us to settle for a lesser life. This path prizes comfort above all else. It savors control. It’s a small path and a very small life. But you will dumb it down, shrink it and manage it to get it to a size you can control and once you know “life is all up to me and what I can accomplish and manage within these narrow borders” then … you will see no need for God. Nothing in your life will depend on God because you can do it all yourself. There is no Sonship here – no need for it. You and God, you’re kind of partners and since you’ve got it under control, He leaves you alone to do your thing. This is a WAKE UP call men. It is time to stand on the walls and shout and wake up the men around us. What kind of man do you want to be? Are you going to choose the safe path of control, predictability and comfort? Or will you choose the Wild Goose and embrace Sonship with the Father?